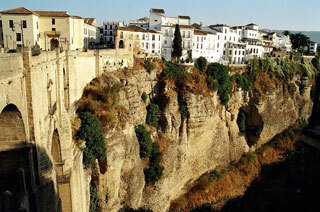 Ronda is set in and around a deep gorge spanned by an impressive bridge, which brings in many day-trippers from the Costa del Sol and other places to admire the view. However, Ronda is also a remarkably pretty town with beautiful architecture from the islamic period up to the 19th century, romantic winding streets with white-washed houses, some interesting museums, and lots of good places to eat and drink. It is also a good base to explore the surrounding area, where you will find beautiful mountains and many of the iconic pueblos blancos (white villages) of Andalusia. This article uses material from the Wikipedia article "Ronda", which is released under the Creative Commons Attribution-Share-Alike 3.0 License.